I feel like I am living in the land of perpetual sickness at the moment. We all seem to be taking our turn with the various colds and flu viruses that are flying around and I don’t think we’ve had one week in the last couple of months where someone hasn’t been feeling a bit under the weather. Being at home with the kids most of the time makes me feel very susceptible to the bugs that they invariably end up picking up from nursery, playgroups or generally just playing with other children. So in an effort to keep myself healthy and happy I decided to make my own immune boosting Honey, Lemon & Ginger Jar. The concept is as simple as it sounds…. honey, lemon and ginger layered together in a jar and kept in the fridge. Every morning I add a couple of spoonfuls to a mug of warm water and sip it whilst getting the kids’ breakfast sorted. I know some people may prefer to make this kind of drink fresh every morning but I don’t always have fresh lemons and ginger to hand and sometimes the sheer act of having to slice them up is too much hassle so early in the day. Super lazy I know, but this method means I always have the ingredients on hand and I’m far more inclined to stick to this routine when it just involves putting a couple of spoonfuls into some hot water. If you can, use raw local honey. The honey you buy from the supermarket is usually pasteurised and this process can cause the honey to lose many of its fantastic health benefits, most notably its anti-bacterical, anti-viral and anti-fungal properties. Local honey also contains pollen from your area and consuming a little every day in the run up to summer is said to help people who suffer badly with hayfever. As well as acting as a precautionary cold and flu defence, this drink is fantastic if you do come down with any bugs and are suffering with a sore throat. It is suitable for children too. My 3 year old drank a small cup recently when she was complaining of a tickly throat. Just remember that honey isn’t suitable for babies under 1 year old. Here’s to a whole week bug-free in our house! 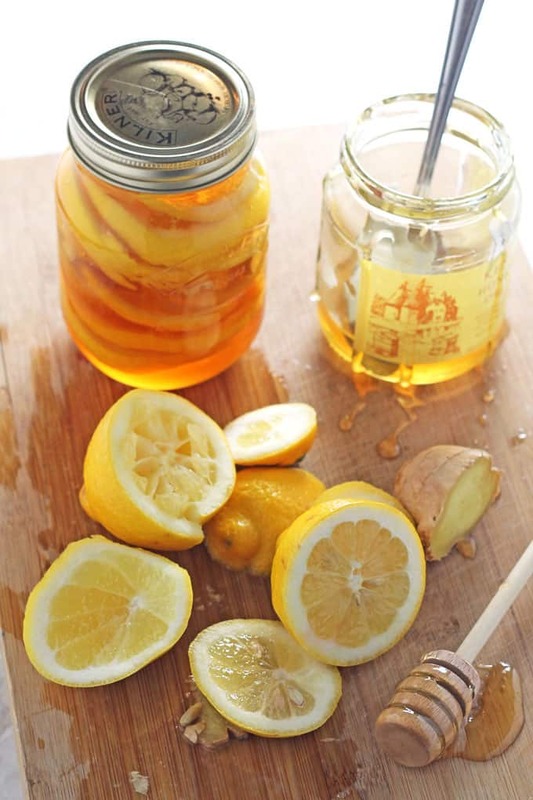 Add the lemon, ginger and honey to the jar in layers. 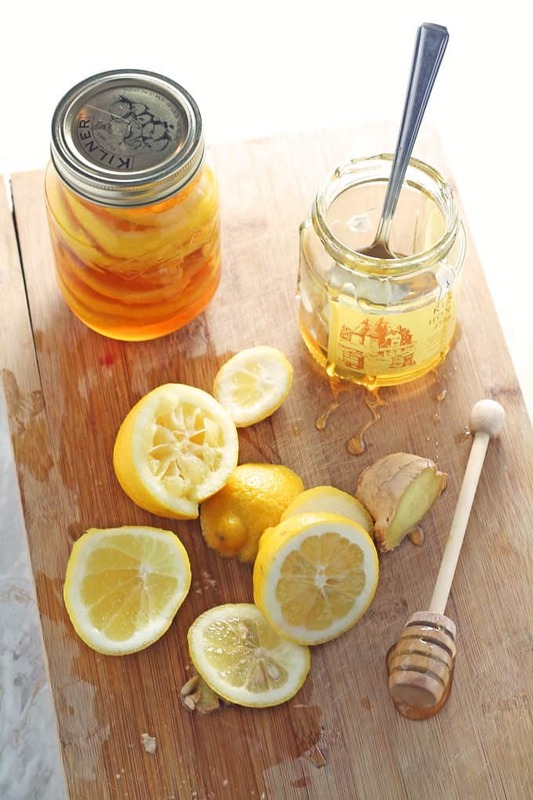 I placed 2-3 slices of lemon in the jar, added a couple of pieces of ginger and then a few spoonfuls of honey. Repeat until you have used all the produce and the jar is full. Screw the lid on tightly and put in the fridge for at least 12 hours before using to allow all the ingredients to combine and the flavours to infuse. When ready, add one or two teaspoons to a mug of warm water and drink immediately. 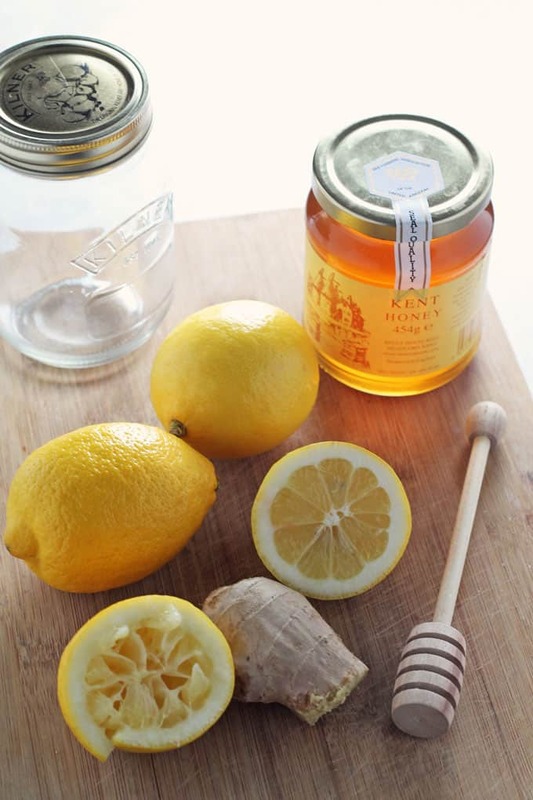 It is normal for the lemon juice and the honey to separate in the jar. The honey will settle at the bottom and you will get a delicious lemon and ginger juice towards the top. Rather than continuously mixing them back together I simply take a spoon of the juice and a spoon of the honey from the jar each time I use it. The mixture will keep in a sealed jar in the fridge for up to 2 months.